~CHiCA Kosaka~: Yu-Gi-Oh! 3D Bonds Beyond Time Mania! Yu-Gi-Oh! 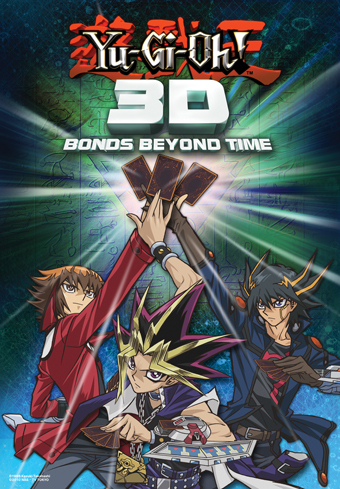 3D Bonds Beyond Time Mania! This weekend showed the first 2 screenings of the new Yu-Gi-Oh movie.This movie was released in Japan last year and made its debut in the US this weekend and March 5-6 will be the final screening weekend. I had vacation last week so my local theater screened it early and so I thought "What the hey?" And so I went...The movie was great in my opinion. I was having 2nd opinions about seeing this movie.However,in a way,4Kids's idea of putting the 10 minute prologue of the characters in the beginning was a good thing because I never really watched GX or 5Ds and it was able to clear up some things for me so that was a plus in my case. There weren't many people at the theater I went to.Only about 1/4 of the theater was occupied and believe me it was a big theater. I guess peoples who had vacation weren't aware of the early screenings because I heard tickets were being sold out all weekend.The fans who attended the weekend screenings were greatly satisfied with the hour long movie,some even went to see it a 2nd time. Tell me,isn't Paradox A BADASS?!? So,if you weren't lucky enough to catch a screening this weekend or weren't even aware of this movie coming out,GO SEE IT. Enjoy the movie!...Hey,maybe I'll catch a 2nd screening this weekend!